The Maya society flourished in parts of Mexico and Central America from the late first millennium BC until the late first millennium AD. Its height, called the “Classic period”, spanned the years 300–900 AD. The Maya founded numerous city-states, each ruled by a lord and supported by a hierarchy of elite and common folk. of the Young God of Corn. As in any stratified society, Maya nobles enjoyed prerogatives denied to their underlings. One privilege was the wearing of precious ornaments that marked their elevated rank. In Maya society, jade was valued beyond all other materials, so the most desirable and expensive adornments were crafted of the hard, verdant stone. The scarcity of jade can be inferred by the frequent uneven edges or asymmetry of completed objects: rather than cut away the “excess” and waste it, the stone was finished to preserve as much jade as possible. Two late Classic period royal jade pendants, acquired by Samuel Merrin for the gallery, are exquisitely carved in the form of human heads, each with its own embellishment of earspools (or perforated lobes for the addition of separately fashioned ear ornaments) and headdress. The leaf-like shape of the headdress elements allow us to identify the individuals represented as the Young Maize God. 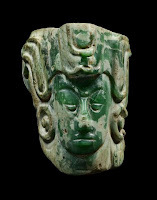 A similar jade head of a Maize God, though without the perforation that permits wearing, is in the collection of the Museum of the American Indian and can be seen in Linda Schele and Mary Ellen Miller's 1986 book, The Blood of Kings: Dynasty and Ritual in Maya Art (no. 560). of each pendant, allowed it to be worn. The variegated green tones of the jade stone make for a particularly appropriate medium to represent this deity — the verdant hue evoking all things green and flourishing. The compact, ovoid form is meant to suggest the seed corn that will produce the mature plant that is the basis of the Maya diet. The Young Maize God began his mythic life as a mortal, Hun Hunahpu or Hun Hunahaw (literally, first first lord). He and his brother were ballplayers of uncommon skill. The Popol Vuh, a 16th century Quiche Maya tale that has survived, tells of their invitation to play the ballgame versus the lords of the Underworld and the trickery that was employed in their defeat and execution. It fell to the semi-divine sons of Hun Hunahpu, Hunahpu and Xbalanque, to avenge their father and uncle. After many adventures and the use of great cunning, not only were the so-called Hero Twins successful in this mission, but they also enabled their father and uncle to be resurrected, the former as the Young Maize God, a primary deity for the Maya people. The father of the Hero Twins becomes the Young Corn God after being resurrected. He is sometimes shown being dressed by maidens prior to his resurrection. Images of the Maize God appear in a variety of media. He was a favored theme on painted pottery. Mary Miller and Simon Martin's 2004 book, Courtly Art of the Ancient Maya, depict the deity while dancing, the corn silk and corn husks that wave in a breeze granting graceful movement to the actual plant and appearing like purposeful movements (plate 29). On a painted cup (fig. 15) his sons and a group of beautiful ladies of the Underworld, bring him his jewelry and garments in preparation for his rebirth. A well-known tripod plate depicts the actual moment of his resurrection (fig. 16). Here, the virile, young god emerges from a seed, deep within the belly of a turtle, which represents the Earth. As his sons assist, Hunahpu offering a hand and Xbalanque providing nurturing water, the Maize God rises already bespangled with jade ornaments and a (green) quetzal-feather headdress to emphasize his fecundity. In fact, in order to replicate the Maize God’s regeneration after death, a Maya lord would be clad in the costume of the Maize God, replete with jade adornments, when he was placed in his tomb. These jade beads were, therefore, precious and also vital to ensure the cycles of dynastic continuity and agrarian fruitfulness.